JVP, for the past 19 years, is working for the empowerment of deprived communities, focusing on promotion of information technology, Self Help Groups and micro insurance. It has started a joint venture with NASSCOM for programs such as Big Bridge and Big Tech (hardware donation programme that provides NGOs access to refurbished computers with licensed software, donated by IT Companies). This has enabled the members and beneficiaries of JVP to reap the advantages of latest technologies. JVP provides computer education to tribal students at a subsidized fee of Rs5 to Rs10 with the support of the local headman in Ranchi. It also plans to open a portal for the local craftsmen to enable them to sell their products online. JVP’s tie up with Micro-LIC of India helps people in the unorganized sector get insurance upto Rs80,000 at a low premium of Rs50 to Rs100. From the past one and half years, JVP has extended its support to Disney Primary School in Delhi. It encourages the local poor and children of migrant labourers to attend the school. It also provides educational support such as textbooks, notebooks, stationery etc. to around 300 students out of which 75 are from Disney School. Disney School charges minimal fees of Rs35 to Rs40 per month per child. JVP collects membership fees of Rs50 per month and Rs500 annually from their members which ensure regular income in form of membership fees. 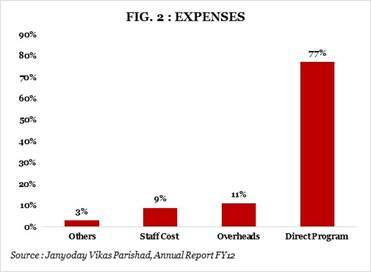 JVP does not have corpus fund and their major source of income is individual donations. On the basis of our calculation of the ratios, we derived the ratio of 1 (ratio measures how much of expenses can be met from own income – individual donations/corpus income/fee income) which is a good ratio. However, these funds are insufficient for their activities. Despite being in the sector for about 19 years, JVP has managed to generate income of about Rs0.7mn only, which creates uncertainty regarding its sustainability and existence. Currently they are raising funds through local individual donors and through social networking sites and are seeking alternate ways to raise adequate funds.